or every action there is an equal and opposite reaction. Thus, to the lies and evil-doing at Fox News, it was inevitable that there would ultimately be an MSNBC. They would be the truth tellers…the home for the majority of voters who reject all that Fox holds dear. But, how are they doing? Well, they earn high marks for sticking to facts—but of course, which facts is always an issue. Like any other media outlet, the essence of “bias” is mostly determined by what makes it to publication…and alternatively, what’s ignored. MSNBC tends to fall short here, as hour-to-hour topic repetition (with notable exception) is prevalent. In any case, in the end a news network will be known for its “talent”—those people whose mugs you see on your screen every day. 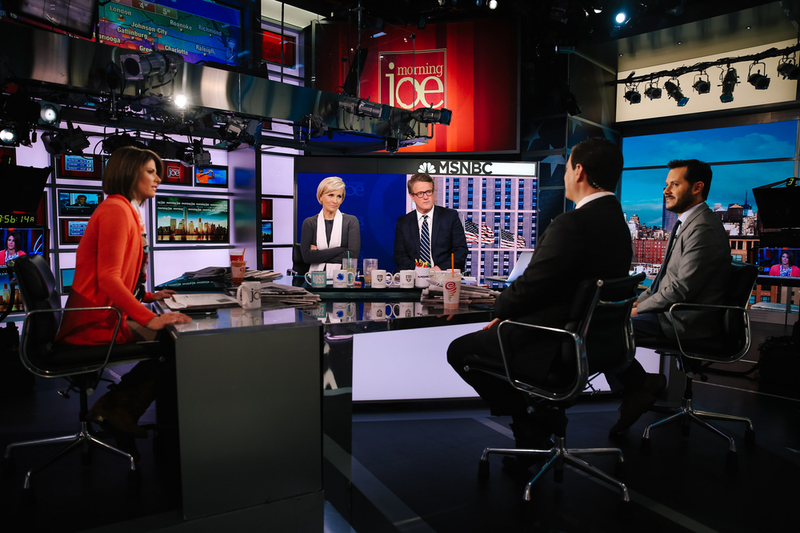 What follows is an entirely subjective assignment of grades to MSNBC hosts, listed in their approximate chronological appearance from daybreak until deep into the night. I love news, but I live on the west coast. There is no way I’m getting up at 3am to watch these two. Feel free to assign you own grade in the Your Turn section below. Her humanity and compassion come across as entirely authentic—and so does her expertise. Her background on Wall Street allows her to explain economic and fiscal deeds and misdeeds that leave most other anchors—outside of the financial channels—grasping to understand. She is the up-and-comer. Battle-tested by being an embed reporter in the White House now, and previously on the Ted Cruz campaign. Smart and direct. Watch this space. Born in Kenya, raised in Canada, arrived at MSNBC via both CNN and the Al Jazeera network. He co-hosts an hour with Ruhle, which doubles down on the network’s financial expertise. He’s also a practicing Muslim. Good on you NBC. Long on reporting experience, she has difficulty talking—a drawback for TV. Anyone who’s been at it as long as she has is bound to make mistakes. But I don’t know if I can ever fully forgive her for helping leak the identity of CIA agent Valerie Plame…or marrying Alan Greenspan. She deserves props for dodging all the barbs sent her way in covering the Trump campaign. But that’s it. NBC’s propensity for promoting people before they’re ready comes to a boil here. She suffers from Chris Matthews Disease (see below): interrupting, correcting and virtually berating her guests when they give an answer that she herself would not have given. She does not understand the difference between the “host” and the “expert”. Pathetically precocious. With a family lineage of broadcast news and an entitled, prep school upbringing in a tony section of L.A., she is pretty much what you would expect. If she were male and conservative, she would be Brett Kavanaugh. I don’t doubt that she was the smartest kid in her sixth-grade class. That still doesn’t mean you give an 11-year-old the keys to the car. Kasie Hunt would slot in nicely here. What do you know? One of the stars of the “liberal” network is a turncoat from the GOP. She was George W. Bush’s Communications Director and brings with her a Rolodex of sources who wouldn’t even answer the phone if most MSNBC hosts dialed them up. When she’s on the same set with fellow Bush era insiders, there is no better truth-telling anywhere on cable TV. Her only drawback is that the definition of her program prevents her from branching out into topic areas beyond the presidency. That should change. I get the feeling that Chuck carries the burden of being from “the other side”—not politically, but corporately. As host of the hallowed weekend show Meet the Press, Chuck seems to believe that objectivity is his gift to MSNBC. That’s probably part of the reason he sometimes comes across as soft or missing the point. He always seems half a step behind everything. So, here’s another “bonus add” kind of anchor, with excellent credentials as a law and justice reporter, notable for his informed legal insights. However, his cloying, desperate attempts to appear hip by consistently referring to rap musicians are not so keen. Ari, run on your record—not on your records. Hardball is a daily hour of Chris Matthews interviewing Chris Matthews. Guests are only there as props. Want to know what Chris thinks? Hold on ten seconds, and you’ll find out. A Catholic who graduated with a degree from Brown University in philosophy. You can understand why he’s a mess. His political instincts are correct for his network, but his demeanor is a disaster. He simply CAN NOT BELIEVE what’s going on! And he lets you know by guffawing, sputtering and screeching at every outrage that passes through his head. ADHD? Like Tur, he’s not ready for prime time. A good mind—on the wrong side of the camera. Rachel Maddow is a wonder. Not because of her Rhodes Scholarship. Not because of her doctorate in philosophy from Oxford. But because of this: there are virtually no talking head panels on her show. You know why? Because she, in effect, runs her own news organization. In the sea of sameness that is MSNBC, Maddow’s stories are typically entirely original…or at least original takes on the top news of the day. Her staff of producers and writers does its own digging. And the results are satisfyingly refreshing. (Her stand-alone podcast Bagman is a case study in journalism reporting and writing.) The only thing that holds her back is her penchant for repeating herself—sometimes to the extreme. It’s OK, Rachel—we get it! He’s the best because he’s the smartest—and by that, I don’t mean the most intelligent. (I don’t know his or anyone else’s IQ). I mean smart in that he can see through all the smoke and mirrors and tell us exactly what’s happening in Washington—and why. That’s because he’s done it all, and he knows it all. I’d probably give him the A+ in any case, but the fact that he spent so many years helping make West Wing one of the best TV shows in history cements the deal for me. OK, we understand. Williams pumped his journalistic resume and was sent to the principal’s office for punishment. Fine, no problem. But let the guy out—he’s done his time! (If you’re still curious about what might have been going on with Willams’ and his ‘lie’, this Malcolm Gladwell podcast is probably worth a listen.). He may be the best natural anchor in NBC history—certainly better than Brokaw, every bit the equal of David Brinkley, and perhaps even in league with the razor-sharp writing and elegant delivery that defined John Chancellor. Plus, he has the native skill that all good interviewers possess—he listens. Anyway, maybe he’s OK with pulling the night shift, in which case it’s certainly OK with me. But if he wants more, he should get it. This is a bonus grading—Joy doesn’t have a regular weekday gig—but that’s the whole point. Why not!? She is as natural a TV host as anyone listed above…and whip smart. But she was disciplined for tweets she posted a decade ago. Like Williams, maybe she’s spent enough time in the gulag. MSNBC, bring her fully back. She’s far more capable than half the people listed above. At this point, you’re only punishing yourself. SNBC, I salute you for the best of your work…and for being absolutely essential at this time in our history. Now, take the brave step of making yourself even better.